I’m in the process of copying over my notes from the old Annotated Infinite Crisis site and had honestly forgotten how much stuff I’d put into that; not just the seven issues of the main series but a whole bunch of tie-ins and other odds and sods. It’s going to take me a while to get all of that over here, re-do some images, put correct links in to new pages and so on, but it’s getting there. 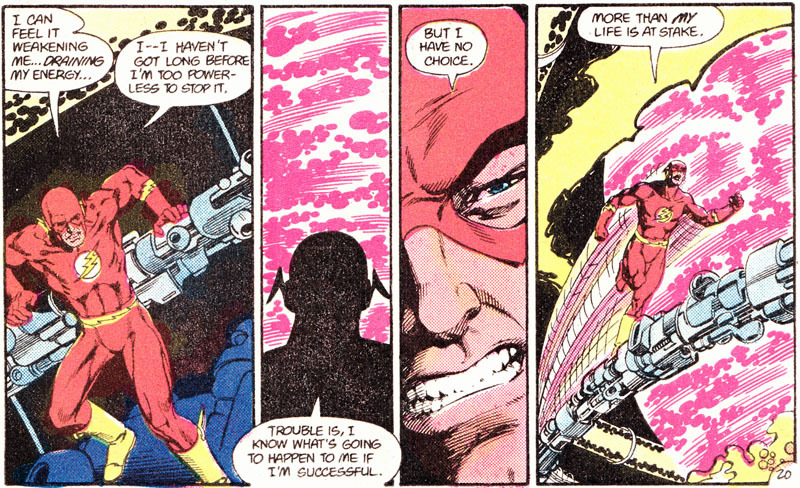 Page 24 – Panel 7 From out of the Speed Force, grabbing Superboy-Prime around the neck comes Flash (Barry Allen), grandfather of Kid Flash. Barry is rare in the world of superheroes: a character who died and, to this day, remains dead. He has appeared occasionally (usually in The Flash during a time-travelling storyline or as a flashback) but in the present day he is still dead, having given his life during Crisis on Infinite Earths. You have to bear in mind that I wrote the above in 2007 when Barry Allen was indeed “a character who died and, to this day, remains dead“. The idea of bringing him back at that point and basically negating his hugely heroic death in Crisis, was just unthinkable. And then they went and did it just a year or so later. Death – it just doesn’t stick, does it? Posted on Thursday, September 17, 2015 Monday, October 15, 2018 by GaryPosted in AnnotationsTagged Flash (Barry Allen), Infinite Crisis.